Early on a recent Sunday morning it was sunny and not too cold so it was perfect for a walk along Queen St West in the Parkdale neighbourhood. 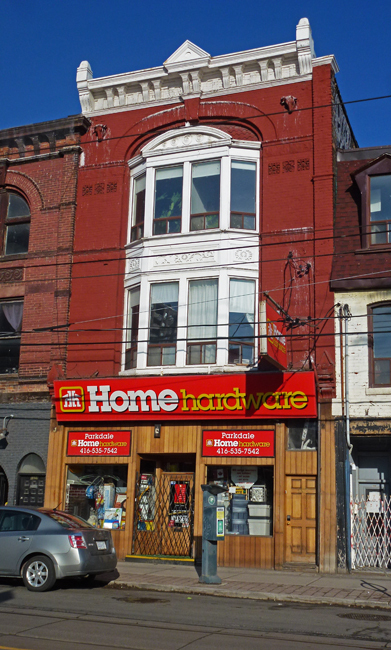 I had my studio near here for years and the Parkdale Home Hardware was the local source for most things that you needed. The Romanesque Revival building was constructed in 1889 as a butcher shop and if you look carefully you can see two animal heads on the wall up at the third floor. The sky was perfect that morning! Love those bay windows in the two upper floors! Looking at this building filled me with some childhood memories. It made me think of my home town in Illinois and all the businesses that my dad used to take me to. They all seemed to look like this place. Those are great bay windows & the crown atop is beautiful too! A neat looking building. I imagine that shop's been there a good long time. Hello, is this hardstore still in business. These little shops have closed around here due to the big stores like Home Depot. It is a pretty building. Wishing you a happy day! Love it, what a cool building...it looks like the whole block is interesting! ...they are becoming a dying breed. What a grand old building...and it looks as if its been well cared for, too. Nice to see that the hardware store is still there, also. That could be San Francisco - Or Philadelphia, or Baltimore. What a magnificent old building. I'm glad you pointed out the animal heads, because I would have missed them. It's great to see an old building in such fine shape. The animal heads are quite unique. I love that the hardware store is still there and serving the neighborhood. I patronize a local hardware store here, too. The timber work is interesting. You don't see that much these days. Nice building that every city must have. I really like these old hardware stores - they are to find your way around and the staff know exactly where everything is without resorting to the computer! What a great looking hardware store. Since the big box stores have moved in we have lost most of our real hardware stores. Good eye! I didn't know Home hardware was a chain. We have one here. The building has an interesting history. Home Hardware is what is left of the old fashion hardware store. I like that much better than the big box stores. I wouldn't mind living in that top floor if it's an apartment. Uhh, is there an elevator? I'm betting it's one of the charms of the neighborhood. I'm glad you weather was nicer so you could get out again! I'm curious Pat.. what sort of studio? It's a lovely old building, is it still a hardware shop? They are pretty rare these days. I love the parts of cities with retail on the first floor and residences above. I have never lived that way, but I would entertain it.